I spent my week-long vacation in Sevilla, one of the most architecturally stunning cities in the world. Also vastly polluted, with its gracious, hospitable inhabitants saturating the air with car exhaust fumes and tobacco smoke, getting high on sugar, chowing down on industrially produced meat and deep-fried and mercilessly processed foods. We’ve got work to do! Mostly I spent the week listening to my daughter’s stories. I couldn’t get enough of them and she seemed to have an inexhaustible supply. She told me about building adobe igloos and other constructions by using earth, sand, fibers and recycled tires, and about a scientist living in the southern Negev, Dr. Elaine Solway and her Experimental Orchard, where she grows among other exotic trees, the marula tree. Legend has it marula is a delicious fertility enhancing fruit for men and women, with four times the vitamin C of an orange, many antioxidant properties and high protein content. I listened to the story of a generous Bedouin woman, who picked herbs from her garden, gifted Ellena with a bottle of “All-Ills-Defying-Remedy” and carefully wrapped spices. I heard about Mike Kaplin, one of Ellena’s teachers at the Center for Creative Ecology on Kibbutz Lotan who gets up at four in the morning and works into the night but also picks up his children at the bus stop, and somehow manages to spend quality time with his family. I was particularly grateful to hear how Leah Zigmond, the Eco Center Academic and Educational Director, who teaches gardening at Lotan, became the surrogate mom to the group of American students who were part of the program. Leah listened and consoled and baked cookies, when the challenges of poverty and violence Ellena and her friends witnessed on a field trip to Jerusalem, seemed too tough to handle. I loved hearing about Alex Cicelsky, the goodwill ambassador of Lotan who is sure to find you the perfect person to meet no matter where you travel. And of course all of my daughter’s stories were about increasing our individual and the earth’s fertility in the truest, deepest sense. About learning to live joyfully and abundantly without exploiting someone else and damaging the exceedingly more precious resources of our common earthly home. The stories she shared with me were all about learning to distinguish between the needs of the Orphan and the needs of the Visionary. who knows that if we really love ourselves and our children, we don’t have a minute to waste on analysis, discussions, or wait for institutionally sanctioned changes of behavior. That we must begin to act and do all we can right now. One of the required readings for Ellena’s program was a fascinating book by Graham Bell, The Permaculture Way. I loved Bell’s no nonsense simplicity, loved learning from him and the other teachers I”ve been introduced to in the book. The concept of Permaculture, developed by Australian ecologist, Bill Mollison, is a way of thinking, a culture and philosophy that is essentially a radically holistic attitude toward every aspect of our lives. So for example when we are about to buy an item, we don’t just think of its immediate usage, but consider whether its production has polluted the drinking water, or the air. We consider whether the packaging can be re-used or will it create more landfill. Listen to this: “Permaculture,” says Graham Bell, “doesn’t mean abandoning technology. It means that every time you choose to use technology you do so because you really want to, and because it’s the best way to accomplish the task.” Or this: “A second falsehood…is the concept of experts…Experts are expensive people who have some highly specialized skill which is usually couched in jargonistic language…all too often experts are simply protecting their own territory. They do not use their skills to enable others.” Sounds familiar? Many of the ideas in Permaculture about the importance of community, of collaboration, of doing our own thinking and choosing, of behaving responsibly, echo the Fertile Heart™ principles our community has been striving to implement in the last decade and a half. So the book also feels like a huge nod of encouragement to all of us. I highly recommend that you include The Permaculture Way in your personal library. Looks as though it’s time to raise the bar again. Ellena and Graham Bells are challenging me to walk my talk with greater resolve. To live these principles more fully. To observe where I’m wasteful and where I can cut back. One of Ellena’s projects in the program has been to turn our home and our property here in Woodstock into a much less wasteful, much more luscious space. But I’m not waiting for that to begin making changes. Here are a couple of tiny steps I’m commiting to right now: No more off season-organic-blueberries for me. Or raspberries. I want to pay a lot closer attention to the amount of driving I do, and reach out to people in the community about car pooling. How about this? Here is one of the eminently doable adjustments Graham Bell suggest about appropriate water usage: “Why use four gallons of water to flush away half a pint of pee…?” Hmm. Not much of a sacrifice in making that change. I don’t think I’m quite ready to entirely give up taking my “mini-vacation-bath, but I could certainly use the bath water more creatively than simply letting it flow down the drain. Now why didn’t I think of that before? Perhaps before the next Birth Your Next Creation Phone Circle, each of us could observe a little more carefully where we can cut down on waste in our daily routines, and make a commitment to take one small conscious step toward a more ecologically kind community. I bet our born and not-yet-born children would approve of our efforts. What do you think? Thanks for the beautiful picture and post Julia and I loved reading everyone’s post. I think being kinder with the earth and fertility is very closely intertwined. I do make conscious decisions with food but I could do so much more. I find it very difficult to give up blueberries in the off season, even though they are not even close to being as juicy and delicious as they are in the summer. I am going to make more of an effort to only eat the fruits and vegetables that are in season…no more oranges from South Africa…(sold in the local whole foods market!!). I would love to be able to grow our own vegetables but until then I can purchase foods that are grown locally or close to local as possible. Not wasting water at home, turning off the lights when not in use and not buying any plastic water bottles unless absolutely necessary i.e. when I am flying somewhere.. As you said I can very clearly hear my not yet born baby cheering me on!! Thank-you Julia, and thanks everyone else too, for your writing here. I have a busy life and a wandering mind… all in all, I’m afraid I’m a bit of an avoider. But Julia’s words, in her books, here in this blog, and in the phone circles, are a real anchor, as are all the wonderful things everyone else shares here. I keep coming back, and each time I can feel that part of me, deep inside, that I find it so hard to listen to, that part of me vibrating with the profound truth of these words, which are like chinks of light, little revelations, little awakenings. This is the path I want to travel. I will make space for this work, and in doing so, make space for myself, space for this beautiful world, space for my child. Thank you Julia for reminding us that we need to look beyond our personal obsessions and remember that we are part of something much much larger. When you fist introduced the idea that we were led to this journey for a reason, and that it is a gift, I wanted to understand, but ultimately, I wanted to do whatever it took to bring me another biological child. But in the past couple of months I have begun to understand…this longing really is a gift, to understand what really is important in this life, this short time that we are given on this planet. We need to love and protect our home and our fellow inhabitants if we want our future children to be able to experience this beautiful planet. On last week’s phone circle, you asked what our biggest challenges and revelations have been. Although I still struggle sometimes with the imagery exercises, through working with your tools, I have realized the infinite power within myself. I have spent so much of the last year and a half searching for the next thing or person that would help me with this journey- that would magically make me pregnant so that I wouldn’t have to go through the struggle any longer. But then I realized that I need to look towards myself- that I have everything that I need, and it was within me all along. Slowly, I am learning to trust myself and my own voice. I really believe that change can start with one person taking action, whether for personal growth or global advancement. As you encouraged us in your workshop, I aspire to be an “activist mom”, as you truly are. I haven’t used it in a while, but when I did, I was impressed by how people making even small things available–that extra collander in your kitchen you don’t use; the old golf clubs you inherited from your granddad but have no intention of every stepping onto a course–have takers out there who are interested in putting those items to good use. The e-mails can get a little overwhelming (stuff gets offered and taken fast), so I just have my membership connected so that I check in on the web when I’m looking for an item or looking to pass something else on. Thank you for this post. I, like many of the people who have commented have seen similarities in the way the infertility machine views people’s bodies and souls and the lack of attention and hostility many have shown our earth. I feel very fortunate that I work in sustainability. I am an architect in a real estate development company that is focused on building sustainable communities. We have made a committment to build our buildings and neighborhoods in the United States Green Building Council LEED certification system. http://www.usgbc.org This is basically a checklist system wich helps architects and developers bring as many sustainable features as possible to the built environment. You have to get so many points to get either a certified, gold, silver or platinum ranking. So I feel very lucky that I get to contantly explore and implement alternative building materials, energy efficiency, using local resources, solar and wind power, implementing public transportation, reduction of potable water, affordable housing, and so much more. There was a point I thought our journey to our second baby would be put to an end when 7 months ago the company could not make payroll any longer. I did see as the months went by that maybe this event is all a part of my journey. It did turn out the company could continue to pay for our health insurance and a few other items so I could try and get some outside work as an architect. My husband who stayed home with our son fulltime was able to ressurect his carpentry/woodworking business. I work around 20 hours a week on an iou status. And I have been slowly rebuilding my own architectural practice (which meant so much to me) in this difficult economy. Overall, it forced me to really ask myself what I wanted and deal with some orphans. I did look for work and I could have bailed on the company and took another job and the security I though I wanted although I knew in my heart I needed to stay with these people. I said if the ship is going down I want to be on it with you to the end. It has been a great experience and we have grown as a company as we try and survive and re-birth as a stronger company. I think it has helped in my journey to our second baby by getting me to committ to who I really am and stay on that track. It got us to live simpler and I too have gone through the house recycling, selling, donating items. I also shop much savier buying fruits and vegetables in season, buying in bulk and changing our diet to introduce more vegetarian options. I have seen nothing has really suffered in fact our life might be better – more quality time together, more space, healthier diet (organics have not even suffered). That’s got to be better for baby #2. I am working on getting our landscaping on no potable water by using graywater – we need to do some re-piping to divert our laundry and sink water to our cacti and trees. I am also trying to reduce the amount of plastic grocery bags in the landfill by using our canvas bags and taking any plastic bags we do acquire to the grocery store where they are properly recycled. Hi Julia, I ran across your book Inconceivable on the internet, bought it from Amazon for myself and a friend and finished it for one day. Everything I read in the book rung clear, truthful and close. Then I wanted to know more so I connected with you on the Tuesday’s phone circle and ordered your other book and CD-s. Just finished reading all of your blogs. They all impressed me with the common sense of simplicity, clarity and depth. I feel like I am digging for more, looking for more answers to some of my own questions and I have a lot to learn from you. Every single blog touches on huge life aspects summarized wonderfully in down to earth sentences. I am also glad to find other people thinking and sharing my own opinion on the environmental issues for example. I always had that sense of guilt flushing the toilet or draining the bath water knowing there were people in the world without drinking water, among others. It’s also not common to be able easily to share those thoughts outside of the immediate circle, and difficult to propagate the believes in the commonalities of daily life. I try to do my best with my own participation in things which sound true and fair and also helpful for others, they make me feel good, although I know I can do more. On the Tuesday’s call you asked about the most difficult/challenging and the opposite – most exciting thing in current life. It took me awhile to grasp the definition of the question itself and think of an answer. Could there be just one answer? I found some of the ideas in the imagery Orphan-Visionary-UMom helpful and defining. With me through reading and analyzing I am trying to understand the Orphans better versus being afraid or opposing them. That was the big realization I need to go through and hope you can help me with. I will be in touch when I read more and digest more from the information I currently have. Thanks for the work you do. I just spent a 3 day weekend baby sitting my 3 year old niece and my 8 year old nephew. I loved every second we spent together. It also made me remember about the world when I was that age, how much and how fast it has changed, how much WE HAVE CHANGED IT! What will our baby´s world look like if we don´t start taking actions right now. We live in a house that is not to big, but we decided to recycle, so now my kitchen has 4 new big white trash cans so we can separate our trash, I wasn´t very happy at the beginning, but they are the constant reminder for me now that we need to do more and make sure we have practiced so we can teach this to our kids when they come here. Congratulations Emily, I am so happy for you!! You are one more little light that is lighting the way for the rest of us, so we can follow this path of the Fertile Heart! Wonderful thoughts. My fertility journey has definitely taken my husband and I deeply into these types of sustainability questions. It amazes me how much we have learned and changed and grown along the way. We have been working with a permaculture group locally– it’s not only inspiring, but it feels so right, so at peace. We have already dug up half our backyard for gardens! I think the change is looking at everything as what gives life and what takes from life and making our choices from there. Thank you for sharing your experience and own changes. All of this is so very very connected with our fertility, its great to read your blog and be reminded that we can’t just think of our fertility as an isolated issue. I am passionate about sustainability, its how I earn my living and yet despite the years of study, fulfilling work, my “expertise” and the many changes I have made to physical life and home it seems that still I have been living very unsustainably within myself, demanding too much, ignoring so many signs telling me that a change was needed, or at least a need to stop and listen. Sometimes its all too easy to apply the right practice in just one part of our lives but to forget the same is needed elsewhere or within ourselves. Its easy to feel that we’re ‘doing the right thing’ because we buy organic veg or fit solar panels to our house yet still mercilessly drive ourselves or perhaps conversely we learn to meditate and practice it daily yet never give a thought to the weight of our footprint… So how to get truly holistic? How to remember all the parts that need be addressed AND still have light and laughter in our lives? It is possible I am am certain and from the perspective of my fertility I am extremely grateful to you Julia for and reminding me that I am my own authority on this if I only care to stop and listen to what my body has to say, that I need to bring my fertility home again and not leave it the “experts” out there. Thinking about waste, I think about the recent changes in our house, which involved sorting through about 5 years of “stuff” that we seem to have accumulated since we moved to our current apartment. It was all about clearing our space and it turned out to be a very liberating experience. We tried our best to ask ouselves how much of it we really needed to keep. We gave things away, donated a lot of things to the thrift store, sorted a lot for recycling and tried to minimize what ended up in the trash. One result has been a clearer, freer living space. It drains a lot of energy to have all that excess stuff around, crowding out the projects and they way of living that we really want. Tossing out all those unneccessary things frees up that energy. I thought of drawing on the Visionary quite a bit through the process. An unexpected benefit is the feeling of how little we really need. When I’m out at a store, I really don’t have much of an interest in accumulating more things, and am reluctant to buy anything unless we really need it. This is where I’m starting with resource conservation, and it’s turning out to be a very refreshing, energizing experience along the way. One result has been a clearer, freer living space. It drains a lot of energy to have all that excess stuff around, crowding out the projects and they way of living that we really want. Tossing out all those unneccessary things freed up that energy. I thought of drawing on the Visionary quite a bit through the process. 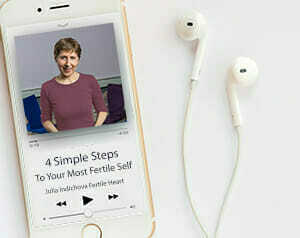 hi, Julia and Fertile Heart Sisters, When I first heard your idea that I should be learning something from my unborn child I have to admit I just didn’t get it. I was so pissed at God for doing this to me. But this past two years have been full of amazing lessons. I’m sixteen weeks pregnant which according to the three doctors I saw was next to impossible. They were so pushing me to do donor. They were talking about donor as if it was just another procedure to get me pregnant. They didn’t seem to take into account the loss of biological connection. I guess what I’m trying to say that thanks to you and the fertile heart work, I learned more from this baby than I learned from anybody else in my life. It’s inspiring to read your post and see how you continue to learn from your children. The fertile heart approach is certainly the most sustainable approach I know of. I intend to keep up this practice for the rest of my life. This pregnancy is a miracle but the changes I was able to make are also completely miraculous. I am making a commitment to organize a carpooling group at my church. I’m also driving way too much, especially on weekends. I’m also going to talk to my husband about this and make a list of other small things we can do. I was watching the disaster in Haiti and thinking how all these natural disasters must be connected to the climate change. So you’re right, we have no time to waste. Thank you, Julia for the work you do!!! Julia, Your post makes me think of how compeltely unsustainable it was for me to go through 5 IVF’s how much emotional energy I put into it, not to mention money and time. I honestly don’t know if I would’ve had the strength to stop that roller coaster ride if not for your guidance and this wonderful community. If I was a not-yet-born baby I would be appalled at what some of us are doing to ourselves. I remember during my first consult with the RE, it was like, if you don’t start the drugs in the next five minutes, you are sure to miss the boat to mommy land. So I jumped and I jumped again and again because I was under a spell. Like you said in one of your earlier posts, this is an industry completely driven by profit. I know there must be good doctors out there that want to help, but why don’t they tell us to do the kind of work you’re doing before we go for the big IVF guns? Wouldn’t that be more sustainable? But that would’t be profitable for anybody except maybe for some organic farmers. Anyway, thank you for helping us wake up, very few people in the fertility business are speaking up, your courage is commandable. Count me in for the future Rebels Circles, and please let me know if I can support you in any other way, your work is extremely important and you absolutely deserve the support of the community.